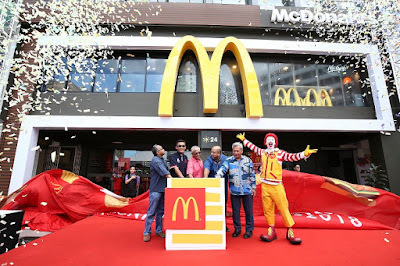 As part of the organisation’s innovative plans to modernise experience for customers, McDonald’s Malaysia celebrated the grand opening of its remodelled restaurant, known to the locals as McDonald’s Padungan. 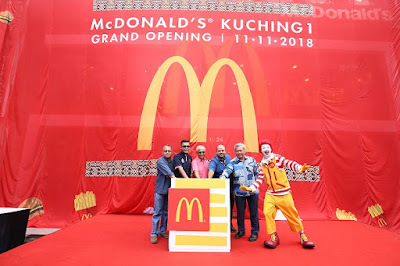 McDonald’s Malaysia also held a community event at the remodelled Padungan outlet, which was the first McDonald’s restaurant to open in Sarawak. “We are celebrating a joyous occasion today as it is the 25th anniversary of this outlet, which happens to be the first McDonald’s restaurant in Sarawak. 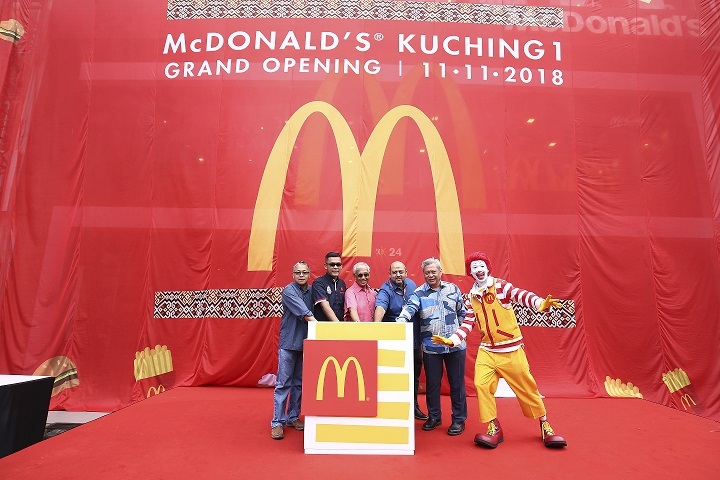 To make this occasion a momentous one, we are unveiling a fresh new look for the restaurant,” said Managing Director and Local Operating Partner of McDonald’s Malaysia, Azmir Jaafar. “We have been progressively modernising McDonald’s restaurants nationwide since late last year and have been rolling them out in stages ever since. This is part of our efforts in creating a modern and welcoming environment while providing our customers with high quality food at great value and exceptional customer service. This restaurant is also the first McDonald’s restaurant in Sarawak to incorporate the table service feature, where customers are given the option of having their food served to them at their tables,” added Azmir. According to Azmir, McDonald’s Malaysia’s plan to modernise the look and feel of its restaurants will see investments between RM50 million to RM100 million over the next three to five years. 1. Table service, where customers can order their meals at the front counter or via one of the ordering screens and choose the option for their food to be served at their chosen table. 2. Self-ordering kiosks (SOKs), where customers can place their own orders and customise their meals according to their preference. 3. Dual point service that enables customers to order through the SOKs or the front counter, before picking up their food when their order numbers are flashed on screen. 4. Cashless transaction convenience so that customers can easily pay for their meals using credit or debit cards. 5. Digital menu boards to showcase the menu and on-going promotions, improve customer experience when ordering over the counter. 6. High speed WiFi connectivity for the benefit of always-connected customers. Datuk Haji Abdul Wahap bin Haji Abang Julai, the mayor of Kuching North City Commission was the guest of honour at the grand opening of the McDonald’s Padungan restaurant. “Companies are constantly improving and evolving according to the shift in customer demands. 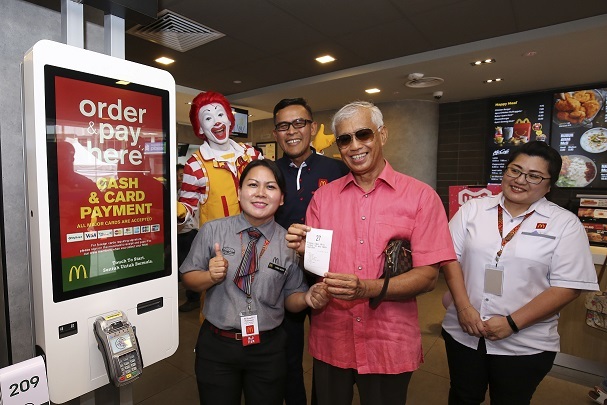 McDonald’s is one of the companies who are innovating while also staying consistent in their commitment to deliver value to its customers while contributing to the local economy,” said Datuk Haji Abdul Wahap. “This restaurant is a favourite among locals and I am very pleased that McDonald’s has decided to give this outlet a fresh new look. McDonald’s plans to upgrade existing outlets and open new restaurants will be beneficial in the long run as this will generate additional jobs and create more business opportunities for local suppliers and service providers within the value chain,” added Datuk Haji Abdul Wahap. McDonald’s Malaysia, under the new ownership of Reza Group, has already committed resources to expand the McDonald’s business in the country. Specifically, as part of the company’s 10-year business growth plan, Reza Group is looking to invest more than RM1.4 billion with a target to have up to 450 restaurants nationwide by 2025 which is estimated to create at least another 10,000 jobs. Today, McDonald’s Malaysia already has more than 270 restaurants in the country with a dedicated workforce of more than 12,000 Malaysians. 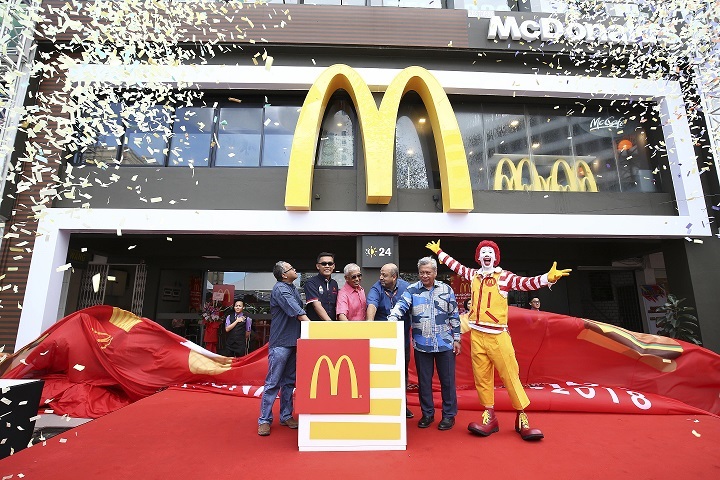 The grand opening was also made more special with McDonald’s hosting a community event at the restaurant to assist the underprivileged community in Sarawak. The event today saw the handover of school packs to local primary school children. 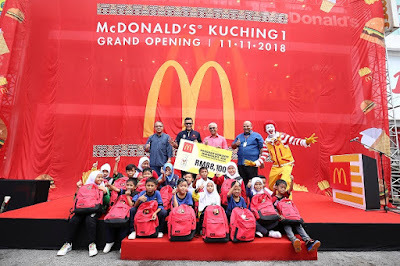 This is an annual “Back-to-School” programme spearheaded by McDonald’s Malaysia and Ronald McDonald House Charities (RMHC) in collaboration with the Ministry of Education Malaysia. As part of the programme, more than 880 primary school children from Sarawak will receive school packs in preparation for the 2019 school year session. The “Back-to-School” programme is supported by franchisees and business partners, and is aimed at providing more than 17,000 urban poor primary school children nationwide with new sets of school attire for the 2019 school year session. Each child will receive 1 set of school uniform, 1 pair of school shoes, and a school bag. Total expected value of contribution under the “Back-to-School” programme this year exceeds RM1.7 million. According to Azmir, the “Back-to-School” programme holds a special place in the heart of both McDonald’s and RMHC because it provides assistance to primary school children from underprivileged and urban poor families. “We have been engaging with children from the different communities that we have been operating in as we want to alleviate the financial burden of the families and motivate these children to enter the new school year with confidence. This is important as they are our country’s future leaders. Late last month, we were privileged to have Dr. Maszlee Malik, Minister of Education with us to officiate the programme in Kuala Lumpur” said Azmir. McDonald’s is the world’s leading global foodservice retailer with approximately 35,000 restaurants worldwide, serving more than 70 million customers daily in more than 100 countries. With 35 years of presence in Malaysia, McDonald’s serves over 13.5 million customers a month at more than 270 restaurants nationwide. McDonald’s employs more than 12,000 Malaysians in restaurants across the nation providing career, training and development opportunities. For more information on McDonald’s, please visit www.mcdonalds.com.my. Ronald McDonald House Charities (RMHC) Malaysia was established in 1990 as a non- profit organisation and is one of more than 300 RMHC Chapters worldwide. It aims to positively impact young lives in the areas of health, education and welfare through its four core programs – Ronald McDonald House (RMH), Ronald McDonald Sensory Room (RMSR), Gift of Smile (GOS), and “Back-to-School” programme. For more information, please visit www.rmhc-malaysia.my.